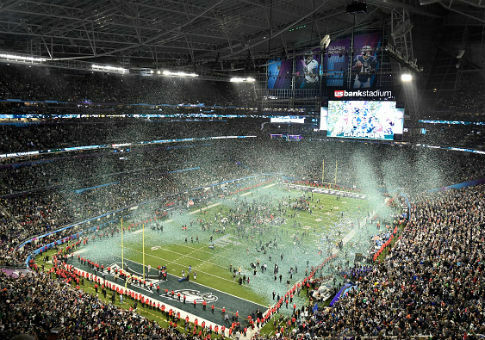 Sensitive Department of Homeland Security documents discussing responses to potential attacks on Super Bowl LII in Minneapolis were left in the seat-back pocket of a commercial plane. The documents from December, which were marked "For Official Use Only" and "important for national security," critiqued the response to a simulated anthrax attack on Super Bowl Sunday, CNN reported Monday. A CNN employee found the documents in the seat-back pocket of a commercial plane. The network decided not to publish its story on the discovery until the day after the Super Bowl; government officials had expressed concerns that publishing it before the game could jeopardize security for the event. The draft "after-action" reports—which were based on exercises in July and November designed to evaluate the ability of public health, law enforcement, and emergency management officials to conduct a coordinated response to a potential biological attack in Minneapolis on Super Bowl Sunday—instructed recipients not to share their contents with anyone who did not have "an operational need-to-know." Recipients were also told to keep the reports "locked up after business hours and to shred them prior to discarding," CNN reported. The CNN employee found with the documents the travel itinerary and boarding pass for Michael V. Walter, a microbiologist who since 2009 has served as the program manager of BioWatch, the DHS program that conducted the anthrax drills in preparation for the Super Bowl. The BioWatch program, which operates a nationwide detection system designed to provide an early warning of a biological attack, has come under fire since its inception in 2003, with lawmakers and the Government Accountability Office questioning its cost and effectiveness. The exercises for the Super Bowl identified the problem that "some local law enforcement and emergency management agencies possess only a cursory knowledge of the BioWatch program and its mission," along with other areas of improvement. But a DHS official told CNN that the department addressed the areas identified for improvement and had "great confidence" in its preparedness. "This exercise was a resounding success and was not conducted in response to any specific, credible threat of a bioterrorism attack," DHS spokesman Tyler Q. Houlton said. At the request of the Department of Homeland Security, CNN said that it is withholding some details in the documents that, if disclosed, could threaten national security. DHS said it is conducting an "operational review" about the missing documents but would not elaborate further. This entry was posted in National Security and tagged DHS, Football, NFL. Bookmark the permalink.